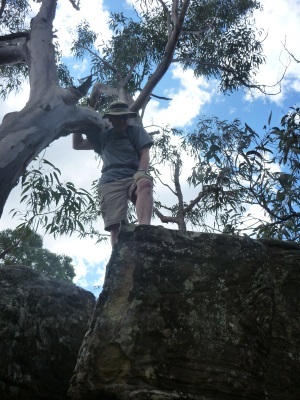 It doesn’t often happen but my grandson, Bailey, and I had a Sunday when neither of us had plans so we decided on a bushwalk and I put the word out to my blog friends. Roy (who’d been keen to go on a walk with me for a while) and old friends Peter C and Kathy D, joined us. As it was Roy’s first off track trip with me, I wanted to make sure that it wasn’t going to burn him for future walks, so, I decided to return to Mogo Creek! Bailey, looking pretty fresh at the start but I think by the end of the day he’d had enough of climbing up the hill! 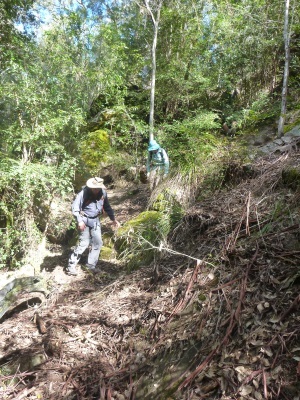 The plan was to go down that lovely spur that we’d visited a few months ago, leave a handline in place and return the same way, maybe a 5 hour walk! 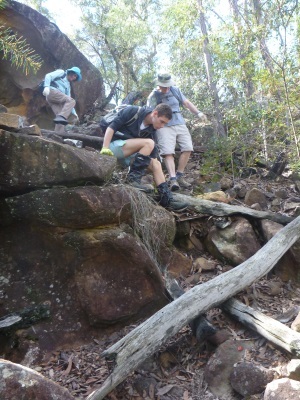 We set off from the Mogo Campground car park at 9.30am and were soon in the scrub, and on the ridge out to Mogo Creek. The footpad (that I’d spotted the last time I was there) wasn’t as distinct this time so there was a bit more scrub involved than I’d remembered. We were soon at the Big Slab of Rock and on our way down the spur, negotiating our way around small down climbs (that I hadn’t noticed when coming up the spur!). Just goes to show that travelling in the opposite direction changes the walk entirely. We were probably a week early for the wildflowers but there was some nice wattle in flower. 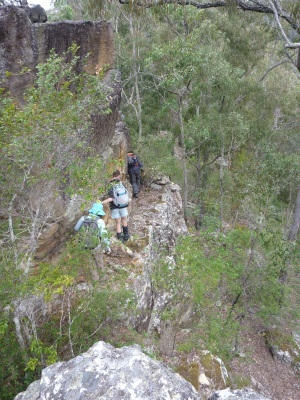 From the Big Slab of Rock, we had about 2k of spur to negotiate to the creek. It took us about an hour to get to the down-climb and I set up the tube tape and sent Bailey down first, soon followed by the others. 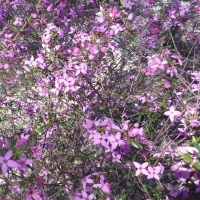 It’s an easy little climb down but the bushes at the bottom were a nuisance, you tended to get caught up in them. At this point, we had to make the decision whether or not to return the same way (leave the tape in place to make the climb up), or do a bit of exploring upstream (retrieve the tape), I guess everyone was feeling pretty strong so we decided to head upstream and find another way out. 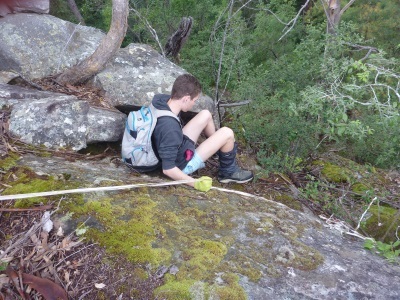 So, tape retrieved, we set off along the ledge … this is nerve-wracking with a new person along, the ledge is only a metre or so wide and drops off on the right, straight down about 10 – 15m. After the ledge there’s another little down-climb (no tape needed here). 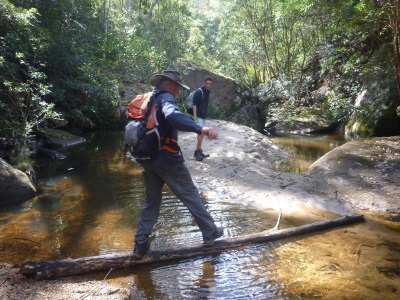 Peter then led the way and we continued along the spur for another half hour eventually dropping down to the creek. We popped out at a large pool and thought about having lunch but I decided to walk a little further upstream to try and find a prettier spot (which we did). After lunch and a cuppa, it was time to head upstream. As with most of my trips, if nothing, they are dynamic … I came up with another option. On my last trip we’d seen a “road” that was on the northern bank of the creek. I’d wanted to go up to that road and see how far it went along the creek, I suspected all the way up to the inholdings further upstream. So, I suggested we go up the hill to find the road. 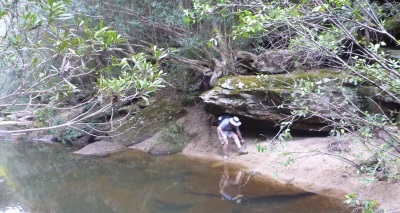 I dragged those poor people 100m up the hill and we found nothing (sounds about right doesn’t it), so we opted to drop back down into the creek. Now I’m going to have to go back again there one day to find it, maybe with a little more daylight, or maybe with some overnight gear and do a more thorough search. Once back in the creek, I sent Bailey out ahead to sus out the route we should take and which side of the creek we should be on (to avoid climbing over rocks), he did a great job picking the best route which involved crossing from side to side, the creek got smaller and smaller so it wasn’t too difficult. 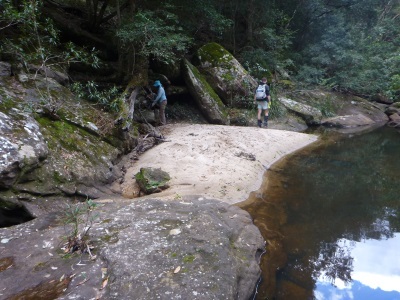 The banks of the creek were really good (as creeks go), the understory was quite open, lots of leaf litter and there were a number of large flat spots which would be suitable as camp sites, nice and open and good access to the water – and the odd swimming hole. Roy trying to keep his shoes dry! 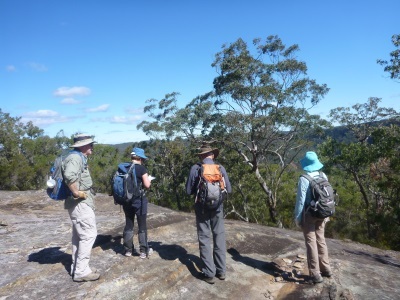 We were hoping to be fast enough to make it to the aboriginal art site, but after 2 hours of negotiating our way up the side of the creek, we decided to call it a day and head back up to our exit ridge. I had been down this section from the Big Slab of Rock before, but even though we were probably within 100m of where I’d come down twice before, the terrain was totally different. We must have been on a bit of a spur because there were far more rock scrambles than I’d encountered the last two times, it was easy going but a 300m climb up. We popped out about 30m from where I’d gone down the last two times! After a short rest, we headed off back to the cars, again the footpad was indistinct so there was more scrub that I’d hoped for, we were all pretty much over scrub by the time we dropped out onto the road. Car to car it was a 7 hour day with about 300m of elevation gain – so much for a 5 hour “day walk”! Roy was a trouper, the walk turned out to be harder than I would have wanted for him (the creek bank involved a bit of scrub), but the walk up the creek was pretty I don’t think I’ve burned him for future walks (unlike many others!). Thanks Peter, Kathy and Roy for joining Bailey and me on this adventure, hope to see you on another one Roy! And, as always, great to see you and Kathy again Peter – particularly on an off track adventure! 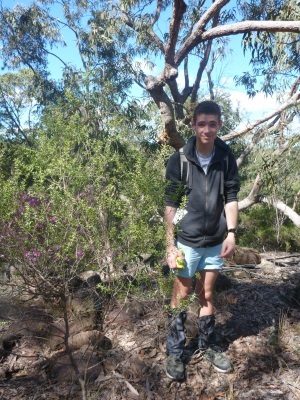 This entry was posted in Bushwalking, Family. Bookmark the permalink. Ha Ha! How long is it going to take you to get over Yerranderie? It seems I’ve scarred you! Wow, what a great walk! The photo’s look beautiful! Was a beautiful day Jen, spring is on the way!